Sitting in a pink bubble in West London on a wet Friday night in January may not seem like everybody’s idea of fun. But when the bubble contains another 250 people, a see-through squash court and some of the world’s top squash players, you may think that it’s not such a bad idea after all. And, particularly if you’re a squash lover, you’d be right. The recently re-launched World Series Squash Finals are being held right now at The Queen’s Club in London. Not just any old Queen’s Club, mind you, but The Queen’s Club. Although I’m guessing that she doesn’t actually play there. On a regular basis anyway. But that’s where the aforementioned inflatable pink squash venue has been standing for the last week or so. And I went to the semi-finals there last night to have a look. To say that The Queen’s Club is a suitable location for a racket sport competition is probably an understatement. It maintains courts for tennis, real tennis, rackets and squash, at least two of which I don’t know the rules for, or anybody who plays them. And when the squash court in the pink bubble is scheduled to be dismantled tomorrow, the club’s members will just have to make do with the 45 remaining courts available to them. Whatever the target audience for the Finals, you couldn’t fault the staging. Clear announcements, great time management, comfy seats, instant video replays, post-match interviews, on-court entertainment between matches (UK hip-hop dance group ZooNation), live commentary and expert analysis (from Jonah Barrington amongst others) via a personal Wi-Fi earpiece, and excellent catering. In fact, had the four semi-final matches scheduled all been walkovers, I suspect that an impromptu tournament and entertainment involving audience members could have been organised on the spot. Health and safety issues permitting of course. On a social level, I met some fellow squash coaches, one of whom offered an entertaining critique of the performance of the team cleaning the court between games. “Look!” he observed. They’re all cleaning the back wall in the right hand corner even though there are just as many marks in the left hand corner.” I even joined in at one point having become fixated with the team’s cleaning strategy. All this, of course, is why going to squash tournaments is so much fun! The semi-finals of the women’s invitation event included former World No 1, Vanessa Atkinson, and current World No 2, Jenny Duncalf. France’s Camille Serme took Duncalf to a third game in the best-of three match before running out of steam. “I wasn’t expecting to win the second game” she said. As I never expect to win any games, I had some sympathy for her. In the other semi, Vanessa Atkinson lost 2-0 to England’s Laura Massaro. By the way, the women’s matches were played using a 17 inch tin rather than the 19 inch tin normally used on the women’s tour. I must try that in my next league match. 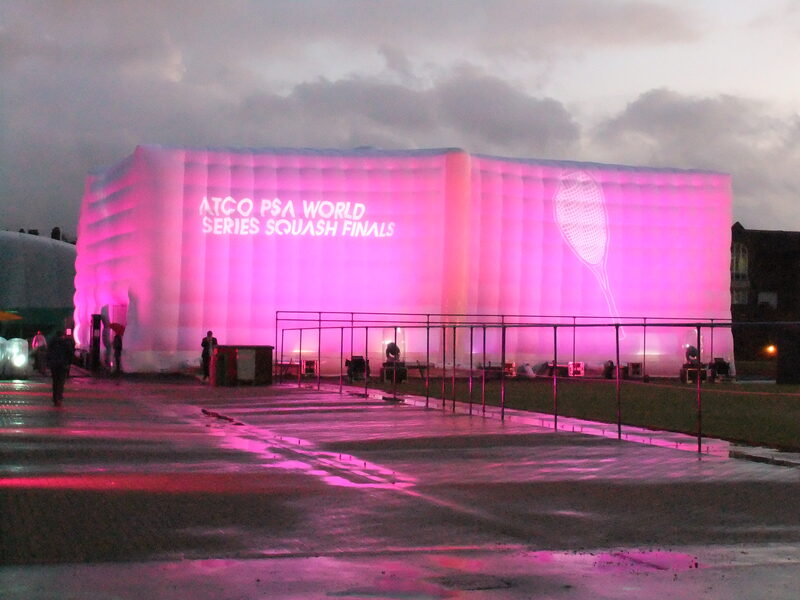 Sadly, during the early hours of the morning after the semi-finals, the inflatable venue for the World Series tournament was seriously damaged by high winds. A tear in the fabric of the building led to it being declared unsafe, then to the postponement of the finals and eventually to their cancellation. At the time of writing, no decision has been made as to where, when or whether they will be played. Never mind, here’s a funky video which should give you some idea of the Pink Bubble experience. Enjoy! This entry was posted in Squash Coaching, Squash Courts, Squash Matches, Squash Players, Squash Tournaments and tagged Female Squash Player, squash coach, squash court, squash court design, squash match, squash passion, squash players, squash rules, Squash Tournaments by Peter Heywood. Bookmark the permalink.